Trace the characters onto the shrink film using Sharpie permanent markers. Or if you have Inkjet Shrink Film, print out the template on the Inkjet Shrink Film. Cut out the characters using scissors. Punch a hole near the top of the character's head using a single hole punch so you can turn it into a jewelry charm. Place the characters on a aluminum foil lined baking sheet. Bake for 2 to 3 minutes at 350F. The pieces will curl up after about a minute and will then flatten out on their own. Once they've flattened, wait another 30 seconds then remove them from the oven. Use a silicon spatula to flatten them out if needed. Use your fingers or needle nose pliers to open up a metal jump ring. Thread it through the hole in the shrinky dink character, then close the gap in the jump ring as tightly as you can. 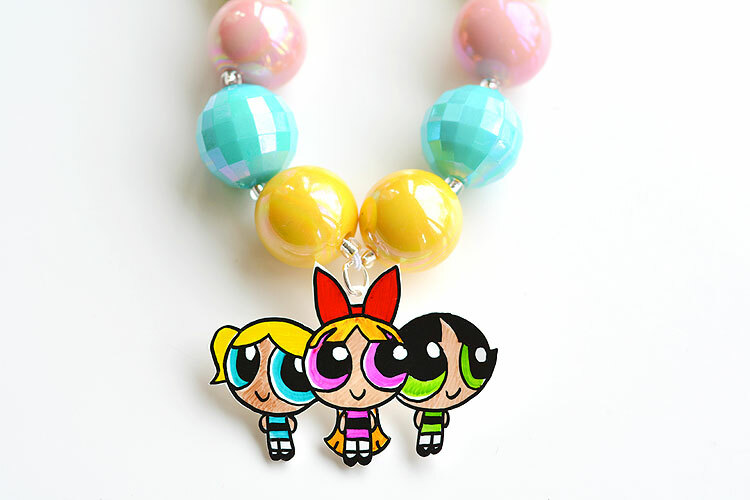 Thread colourful chunky gumball beads along with your Powerpuff Girls charms onto the elastic cording and tie in a knot.